Saint Valentine is getting closer and it is the perfect excuse to beat the winter blues with a romantic gateway, and we can not think of a better destination for that than Cordoba. It is a place full of history (a UNESCO world heritage site indeed), flooded with monuments, quaint streets and charming patios, it has an excellent gastronomical offer, the weather is mostly sunny... Oh, and it is also incredibly beautiful. Due to its convenient size, within a couple of days you can discover the city and its monumental offer without stressing out, in a nice relaxed way, combining sightseeing with a tapas lunch in a typical taberna, or even better, in two or three different ones, and a nice romantic dinner in one of its gourmet restaurants. You can also make a stopover in one of its cozy teterías (Arab tea rooms) or enjoy some flamenco music and dancing at Tablao El Cardenal, which might sound cliché but it is also an unforgettable experience. And speaking of romanticism, how about saving a couple of hours for total relaxation in an authentic Arab Hamman? Possibilities are endless. But the first important decision when organizing a romantic gateway is choosing the right hotel. If there is a time to invest in accommodation, is this one. 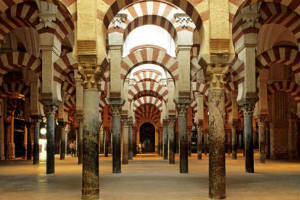 Don’t worry, Cordoba is a pretty affordable destination in any case. You can surprise your partner with a room at the luxurious Palacio de Bailio or at the elegant Hotel NH Collection Palacio de Córdoba. Or perhaps at the charming Casas de la Judería or at the design Hotel boutique Madinat? You definitely can’t go wrong with any of these. After checking in the room and leaving the luggage, it’s time to start discovering town. 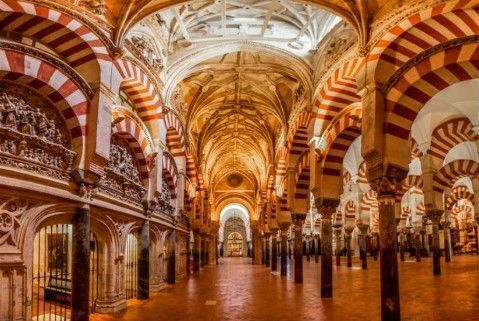 Cordoba is a perfect blend of the different cultures that have populated it: Muslims, Jewish and Christians, all have left their footprint in this amazing city. 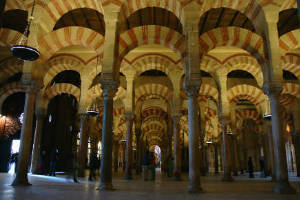 Among all its monuments, the most iconic is, without question, its impressive Mosque - Cathedral which is considered as one of the most accomplished monuments of Moorish architecture and boasts a special peculiarity: a Christian Cathedral (hence the Mosque-Cathedral name) was built right in the middle of it in the 16th Century. The adjacent Patio de los Naranjos, with its orange, palm and cypress trees, is perfect for a little romantic stroll. Walking along the narrow and charming streets of La Judería (the Jewish Quarter), at the North-East of the Mosque, with no destination, letting it surprise you at every corner, can also be a memorable experience. 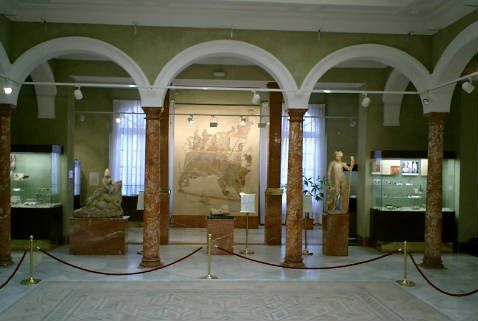 The Sinagoga, the Zoo Municipal and the Museo Taurino are located there. Also visiting Casa Palacio de Viana and walking around its beautiful twelve patios is a true delight for the eyes and the soul. 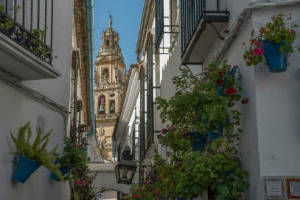 But if those twelve were not enough, the center of Cordoba is populated with them and they are all worth checking, just make sure not to miss the Callejón de las Flores. Perfect scenery for a nice couple picture, by the way! And last but not least, don’t forget to cross the Puente Romano overlooking the Guadalquivir at dusk, it’s a view you won’t forget! But remember, this gateway is not all about culture. 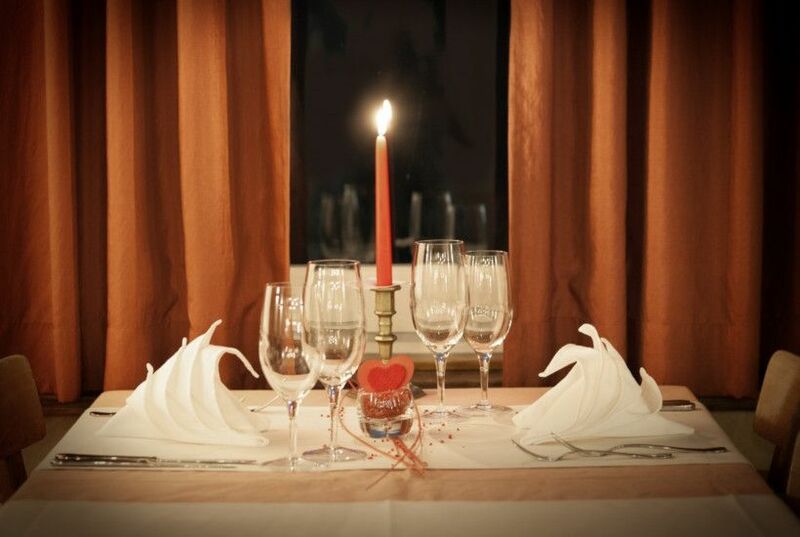 Food is also an essential part of any trip too, specially of a romantic one. Few things bond more than sharing the pleasure of discovering new flavors and textures together. You can’t leave Cordoba without trying the local delicacies such as salmorejo, ajoblanco, flamenquín, berenjenas fritas or rabo de toro. 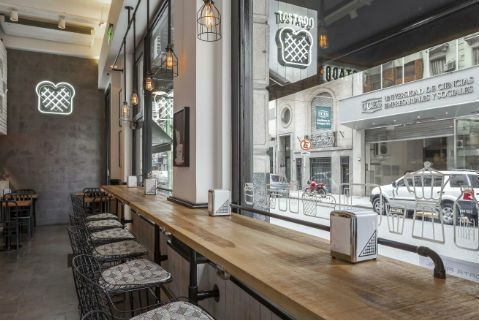 Try these and other typical tapas in one of these picturesque places and you won’t regret it: Taberna Luque, Taberna San Cristóbal, Casa Pepe la Judería or La Bodega. In the evening, why not spoil yourselves with a candlelight dinner in one of these places? Restaurante Noor and Choco which boast one Michelin star each, ReComiendo which has been chosen as the sixth best haute cuisine restaurant in Spain among the Tripadvisor users, or El Envero, a modern restaurant with delicious creative food. Just remember, if you want to mix with the locals don’t book before 21:00! If you are up for a drink or two you can go to Glacé afterwards for a fancy cocktail or to Córdoba Long Rock if you are in a party mood. Then back to the hotel, and well, the night is yours! 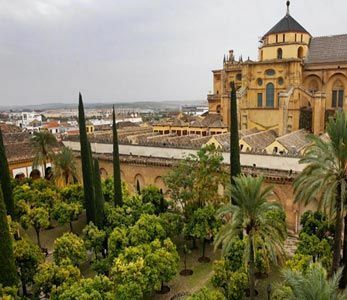 The next day, after an energizing breakfast, you can pay a visit to the Hamman Al Andalus Córdoba, just a few meters from the Mosque. From a ‘water journey’ to a massage, it’s time to indulge yourselves and recover from yesterday’s busy day. And then, after a few tapas, you can chill in front of a cup of Moroccan tea in one of the Judería tearooms before hitting the road with the sweet taste of an amazing couple of days full of unforgettable moments.